In 1 John 4, John the Apostles shared with us some of the most important passages in the Bible on love. Because John is often referred to as the “Beloved Disciple,” it is understandable that he should talk about love on several occasions. 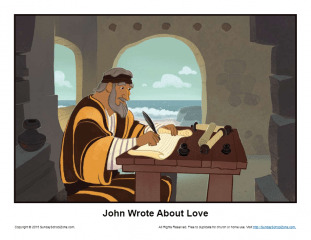 This John Wrote About Love Story Illustration will help kids remember this important author and what he had to say about love. This story illustration can be used in a Sunday School, classroom or homeschool setting.